BUTTERCUP IS A BEAUTIFUL RED FAWN! HER DAM, PUNKIN, (SIRED BY DEUCE - BLUE AND TAN) WAS THE SAME COLOR AND PRODUCED US LOTS OF WONDERFUL PUPPIES. BUTTERCUP IS FOLLOWING IN HER DAM'S FOOTSTEPS. THIS IS BUTTERCUP'S 2ND LITTER. SHE HAD SOME AWESOME ONES THE FIRST GO AROUND OUT OF A BLUE BRINDLE MALE,EVEN ONE CHOCOLATE. BUTTERCUP IS SIRED BY BON JOVI AND WOULD CARRY "AT" ALONG WITH BLUE. THE PUP'S SIRE IS LILAC AND TAN CHASER FROM THE UK. 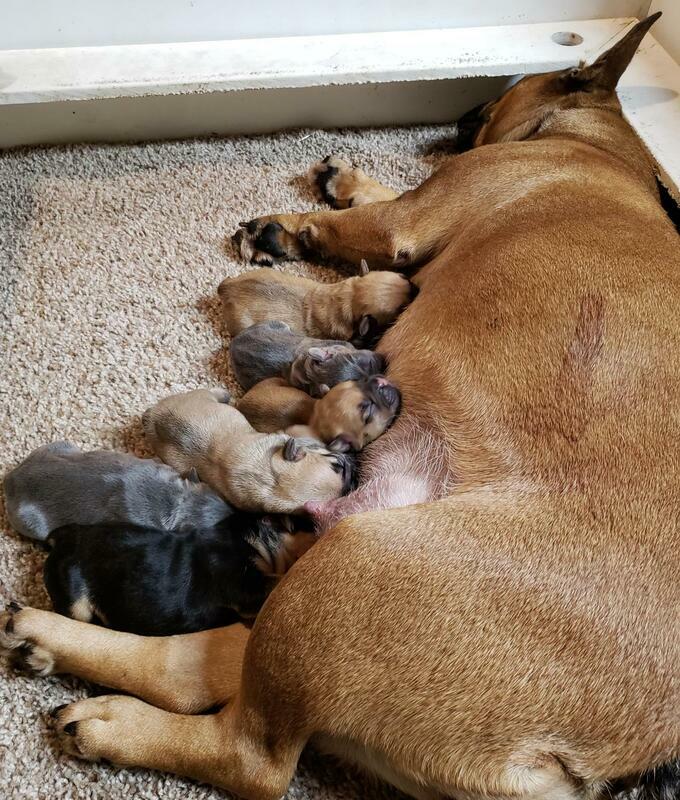 THIS IS HIS 3RD LITTER WITH LOTS OF COLOR FOR US! ALL OF THE PUPPIES WILL CARRY CHOCOLATE, BLUE AND "at"! THEY WILL BE AWESOME PRODUCERS FOR YOU AND I BELIEVE WONDERFUL DOGS! ALL COME WITH PUPPY SHOTS, SEVERAL WORMINGS AND WILL BE EATING GOOD! THEY COME WITH VET CHECKS AND HEALTH PAPERS AND A GUARANTEE TOO. I REQUIRE A 300 HOLDING FEE AFTER PICKING THE PUP OF YOUR CHOICE. WE APPRECIATE YOU AND THANKS FOR LOOKING AT THE PUPPIES! THANK YOU FOR LOOKING AT THE PUPPIES! They are guaranteed against any genetic defects always! All come with full AKC breeding rights, puppy shots and several wormings. Vet checks and health papers too. Hope to hear from you! A 300.00 non refundable holding fee is required to hold your pick! Any questions, please do let us know! 417-259-2704 call or text anytime!